"At eight our boats are ready. We would like to share a boat with our friend Caroline, but since these boats only seat three people and there�s a guide in every boat, that�s not going to happen. We�ll be going into the smaller canals that lead deeper into the island. Since our boats are propelled by man- or actually womanpower, the sound of roaring and chuffing engines dies slowly as we move away from the main waterways. The women have a special rowing technique, they stand on the stern of the boat, pushing the paddles forward, so they can see where they are going. The canals get shallower and narrower, the rowers have to replace their two large paddles with a single small one. We see some men unloading a boat, filled with stones. Apart from the sound of the working men and the quiet splashes of paddles entering the water, silence rules here. On the banks grow wild fruits, like water apples, but we cannot reach them, so I still haven�t got a clue what they taste like. " 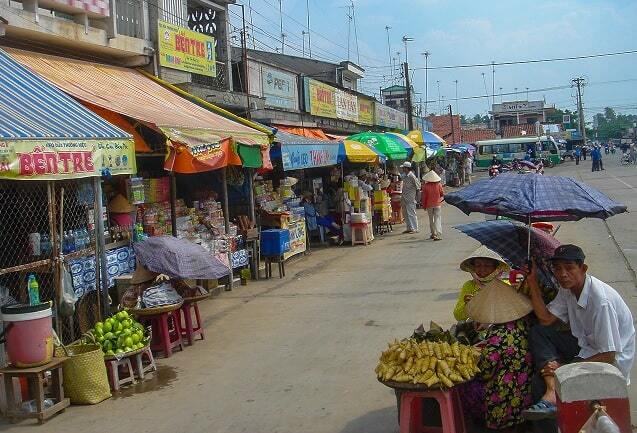 Ben Tre - has long remained outside the tourist traffic. It was an island across the river with a quiet and sleepy town. To make a nice boat trip through the delta of the Mekong, we always went to My Tho and Tra Vinh. We couldn't reach beautiful Ben Tre. The Delta is indeed full of small islands. Ben Tre lay across the river on such a small island, and it was isolated. But by building a bridge between My ho and Ben Tre this place is now accessible. From that moment we could reach Ben Tre easier, but the stream of tourists failed to come. Ben Tre has remained a quiet, sleepy town. Maybe it's this, that some travellers attracts to this place. The sleepy waterfront town is lined with aging villas. Everything is easy to explore on foot, as are rustic settlement across the bridge south of downtown. The population is what conveys the island quiet and relaxed. This is also a good place to arrange a boat trip in the Mekong Delta, especially for those who want to escape the hustle and bustle of a tour bus full of tourists, like in My Tho. Plus, the river promenade and the narrow streets on both sides of the river are ideal to explore by bicycle. 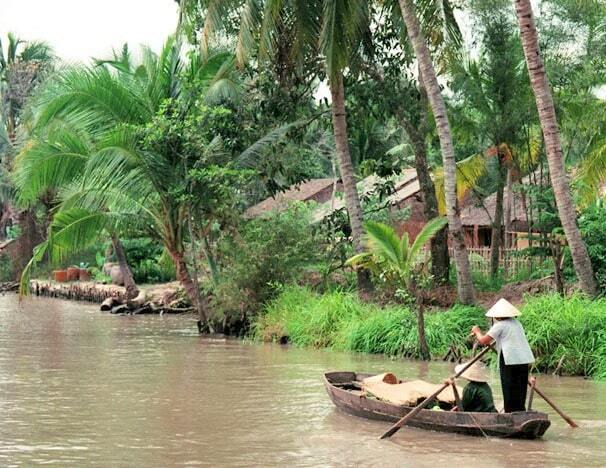 Ben Tre is for tourists still a destination "off the beaten track". It is still not visited very often. Ben Tre is not only famous for its fruit, but also for its coconut candy "Keo dua". Many local women are working in small factories. They are making these sweets in order to earn their money. They spend their days by cooking a coconut sticky stuff in boilers. This they pour out and cut the green stuff into squares. You can plan a visit to one of the factories. You get a brief demonstration, after which the tourists are quickly moved in the direction of the (souvenir) shop. Critics say the women working here do not even have the skills. 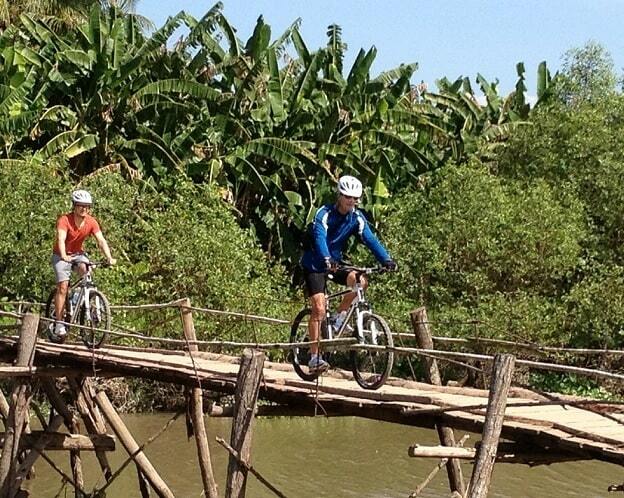 In Ben Tre you can easily rent a bike to explore the beautiful surroundings. The dirt roads along the Mekong water breathes a rustic atmosphere Vietnamese. In the quiet town of Ben Tre is not much to do. The peace and tranquillity of this small town is a world of difference to the activity in My Tho and Tra Vinh. The region is flat with lots of rice fields to cycle along. The cultivation of rice you see everywhere in the Delta. Ben Tre is distinguished by the green beauty of the rice, which is "all over the place" looks. The further you get, the better it is and the roads are pretty good and there is very little traffic. The environment in which to sail through one of the most beautiful in the Mekong. A boat trip is one of the best ways to explore the Delta. A boat trip is extremely popular and is easy to arrange here everywhere. The country, both sides of the channel, is equally fascinating. With a small boat you can sail through the smaller canals. The big boats can't do that here. You sail between fruit trees, coconut plantations and occasionally appears among the trees a beautiful house, where lives the whole family. You get to the more remote areas and the jungle is closer, so that should serve as a nice end of the half day on the water. It is a unique experience. It is hard to imagine for how it must have been, when the US soldiersthe US soldiers patrolled here in the same channels.